I absolutely love cloth nappies and use them exclusively and following on from my review of Cheeky Wipes reusable wipes I also use reusable wipes but haven’t tried any other wipes. So when Bum Deal Nappies offered their new reusable wipes for me to test and review I was keen to give them a go (I have previously reviewed their Bamboo Charcoal Pocket Nappy). 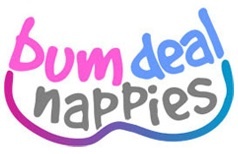 BumDeal Nappies is an UK company based in Ceredigion (less than 10 miles from where we live), Wales which was founded by Ella Parkin in 2010. Whilst expecting her first child, Nellie, Ella looked into using reusable cloth nappies however she was put off with the average cost of a reusable nappy kit being around £250. As she wanted to use cloth nappies and help the environment by minimizing her daughter’s carbon footprint she researched other options and Bum Deal Nappies was born. Bum deal specialise in funky, easy to use cloth nappies at affordable prices. As well as selling cloth nappies and reusable wipes she also sells baby legs, wet bags, bandana bibs, reusable and flushable liners, boosters and soap nuts. Bum Deal Nappies’ reusable Wonder Wipes have been especially made to match their range of cloth nappies and wet bags; so that you can choose prints that match your pocket nappies. Bum Deal Nappies say that “reusable wipes are a great way to reduce your carbon footprint even more!” and that they will also save you a lot of money if you switch from using disposable to reusable wipes. These wipes can be stored wet or dry and can be washed with your nappies and wet bags at 40 or 40 degrees. We were given the Giraffe Wonder Wipes Minky/Bamboo to test and review. The print is gorgeous and matches the Bum Deal Nappies XL wet bag I recently purchased to replace my nappy bin which is just too small and the Giraffe pocket nappy I purchased from them when Tristan was born. I love that you can purchase prints to match your nappies and wet bags. The wipes are a great size being 20 x 15cms, which is a perfect size for cleaning in one go with just one wipe. The new wipes are a minky fabric on one side and bamboo on the other side. They are extremely soft to the touch and very well made. I first used these Wonder Wipes to clean Tristan’s hands and face to see their effectiveness in cleaning him up after a messy meal and they worked brilliantly. The wipe cleaned thoroughly and only one wipe was needed to get him squeaky clean again. I love that the wipes are super soft so they aren’t harsh on his sensitive skin. I have also used these for nappies changes and will be keeping them for this job from now on as I like to use separate wipes for hands and face. I have found they are also great for nappy changes, easy to use and more effective than disposable wipes. Even with a very messy nappy they have effectively cleaned using the one wipe. The bamboo side is brilliant as it collects any mess without smearing and the minky side is extremely soft on his skin. The wipes wash really well and are just as soft as they were new. It is quick and easy to add to the wash along with cloth nappies. I love that with reusable wipes you can be reassured that no nasty chemicals are getting on your little ones skin, you can simply use them with water; I keep my wipes ready to use in a box where I like to add a touch of essential oils to the water. I would highly recommend these Wonder Wipes Minky/Bamboo, I think they are high standard reusable wipes. I love that in one wipe you get the benefit of both minky and bamboo. Using these wipes you can save money, help the environment and use a soft wipe that is kind to your little ones skin. I will definitely be buying some when I can and I love how with the different prints available it is easy to keep wipes for nappy changes separate from wipes for hands and face – you can use different prints for different jobs. The Giraffe Wonder Wipes Minky/Bamboo can be purchased on the Bum Deal Nappies website for £3.99 for a pack of 5 wipes, which I think is great value for money for such a well made set of wipes. Their Wonder Wipes are also available in a range of other prints – Daisy, Dotty, Black Dotty, Zebra, Hearts, Leopard, Green Stars and Brown Cow. The prints are gorgeous and I love the Leopard print in particular! Bum Deal Nappies have a Facebook page and can be followed on twitter @nelliesnappies. I'd like to try a different kind of wipe. I seem to be allergic to most of them. When my children were little, I would have loved to be eco-friendly and use re-useable nappies and wipes. But it just wasn't possible! Being an on-the-go mum, I didn't like the idea of having a smelly nappy on the pushchair for a number of hours. Times have changed from when the mother was expected to stay home all the time. It's good that these wipes are available nowadays. Moms would be thrilled to know that there's a product that would clean and leave their babies' skin healthy. With twins, I have found that the free super savers shipping on economy size diapers is a godsend. The diapers seem a little thinner but I have never had a problem with leaking. They have the same stretch tabs on the sides that I liked about honest diapers. I love having these shipped right to my door & always having so many on hand. It's one less thing to worry about carrying when shopping with the kids. They always ship within a couple of days so I just make sure that I order them a few days earlier than when it looks like we'll need them.